Sammy's Great escape is a animated Warner Brother's follow up film from Turtle Tale - Sammy's Adventure. Two leather back turtles, who are old time friends and grandparents, Sammy and Ray take you on their adventure through the sea world with the newly hatched turtles Ella & Ricky, introducing them to the dangers of the big deep sea. The group are attacked by seagulls whilst on the beach (me & Spud hate seagulls as my regular readers will know) which brought some boo's from our sofa, and some dirty looks from me as we rooted for the team to get away from the flying rats! The seagulls are after the Ella & Ricky, hoping a meal is insight for them, unfortunately for the seagulls and unfortunately for the gang, the leather back turtles are captured by poachers on the beach who take them back to their boat! Unknown to the horrible poachers who have not caught the new hatching's Ella & Ricky, the story truly begins with Ella & Ricky attempting to rescue Sammy & Ray who are on their way to a aquarium in Dubai! It's at the aquarium your introduced to some other sea creatures including Big D who's a seahorse, Lulu the lobster, Jumbo the blob fish and lots of penguins! 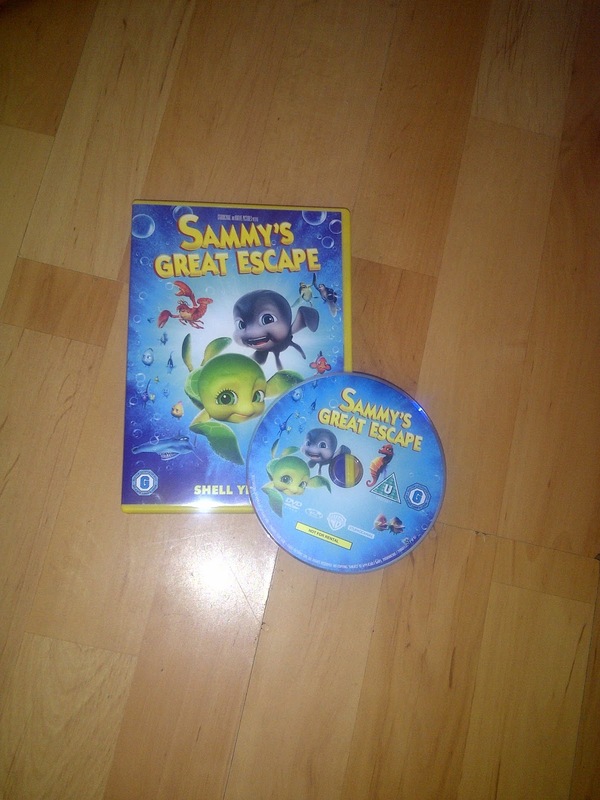 Sammy's Great Escape has been a big hit in this household with Spud wanting to watch it whenever we have visitor's round, he's already lent the film to his two younger cousins, informing them on how great it is! What's even better about this DVD is the fact that it comes with a UV digital copy code which mean's you can download the film on to 5 devices (maximum) meaning you can watch the DVD on the go via your tablet, laptop or you can even be nice and share with your family and friends. Sammy's Great Escape is rated certificate U with a running time of 93 minutes. It's available to purchase for £10 or under from Asda, Amazon, Sainsbury's, Play.com, Tesco and many more entertainment retailers. To find out more about Warner Brothers, including Sammy's Great Escape and any other new and upcoming film titles, check out the official website.